Photograph showing the canal and locks on the Columbia River at Cascade Locks, Oregon. At left are the rapids. Photograph, taken from the water’s edge, showing the Columbia River, rock faces, and forest along the shore in the Columbia River Gorge. See related image No. 371N5680. Image note: Light leaks on negative. Photograph showing a wooden post near the shore of the Columbia River. In the background is one of the high cliff faces of the Columbia River Gorge. See related image No. 371N5682. Image note: Light leaks on negative. 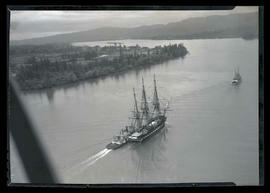 Aerial photograph, taken from the south, of Crown Point in the Columbia River Gorge. The photograph shows Vista House, part of the Columbia River Highway, and the Columbia River channel.